There are a lot of things to consider when choosing a treadmill, especially when you are looking for a high-end model. Whether you put in a lot of miles every week and need one that will not vibrate when you increase your pace or if you are a tall runner who never seems to have enough room on these exercise machines, we recommend taking a closer look at the Sole Fitness F85 Folding Treadmill. Even used in professional gyms, the Sole Fitness F85 Folding Treadmill will always be there, even when you need an intense workout. One of the top treadmills on the market. How Does the Sole Fitness F85 Work? There are definitely some standout features that distinguish this product from others on the market. It is powered by a strong 4.0 HP continuous duty motor that delivers outstanding output. One press of a button can smoothly increase your speed up to 12 mph. It can safely handle up to 400 pounds, and its spacious 22″ x 60″ running surface should be more than accommodating to even tall runners. To ensure the highest level of performance, it has an all-steel, powder-coated frame. Sole also adds a flywheel to the motor because it helps the motor run cooler, thereby extending its life. Not that you will have to worry about the motor though, because it has a lifetime warranty. Sole also chooses to use 2.75″ rollers with copper ground wires. This may seem like unimportant technical lingo, but it means a static-free, smooth-functioning belt, which is actually pretty important. The console on this product is very user-friendly and has a vibrant blue display that is easy to read while you are moving. At all times, speed, distance, time, calories burned, incline, pace, and pulse are displayed. You can increase the incline to 15 percent, and it has a built-in fan to keep you cool. The console even has speakers for your iPod, so you do not have to wear headphones. What Are the Health Benefits of Using the Sole Fitness F85? Working out on the Sole Fitness F85 will benefit your circular and cardiovascular systems, improve endurance, and transform fat into lean muscle, thereby revving your metabolism and encouraging weight loss. When you do not have to fight unfavorable weather outside or drive to a gym you are more likely to stick with your routine to work toward your personal goals. This also allows you to workout in a safe environment. If you have ever slipped on wet leaves or tripped over a tree root on a trail then you understand the severity of an injury that can be sustained running outside, especially during extreme weather conditions. 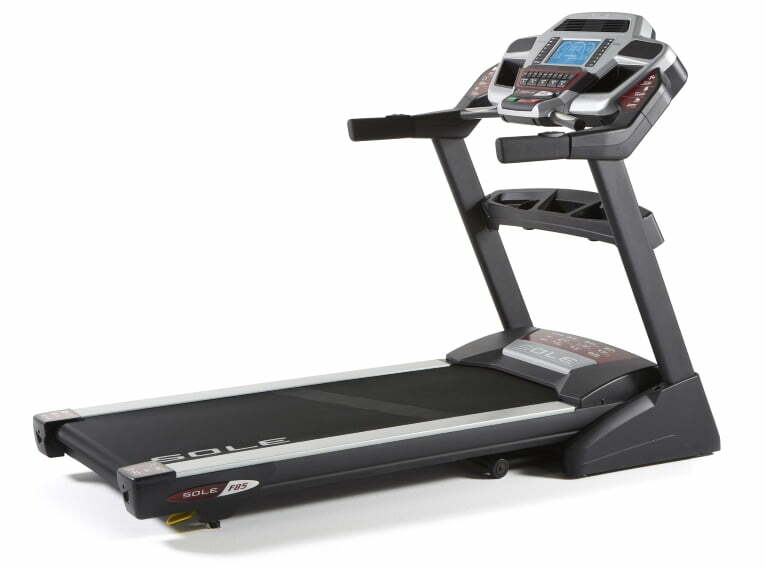 Plus, we love that this treadmill has a Cushion Flex shock absorption deck that can reduce impact by up to 40 percent. Easy Assist Folding Deck design makes it effortless to fold and store vertically when it is not being used. A Peak-and-Valley graph feature allows for a variety in your workout. Strong 4.0 HP motor delivers solid performance at speeds up to 12 mph. Welcomes users up to 400 pounds. 22″ x 60″ treadbelt is one of the roomiest on the market. Cushion Flex Whisper Deck is quiet and absorbs up to 40 percent impact. Built-in cooling fan and speakers. Lifetime warranty on deck, frame, and motor. Electronics are covered for five years, and labor is covered for two years. Although you can find the Sole Fitness F85 in sporting goods stores and online retailers, we strongly encourage sticking with Amazon. When you shop at Amazon you have peace-of-mind knowing that the purchase is made on a secure site that offers fantastic customer service team willing to go out-of-the-way to make sure you are satisfied, if you have any problems with the product or shipping. Not to mention, you can order from Amazon for only $1,760.10, which is 41 percent off the regular price. Plus, you get free shipping right to your door. Although this treadmill falls in second place, there are many reasons why it might be your favorite pick. It is strong, smooth, and capable. The treadbelt is spacious, and it folds for easy storage. The only complaint we have is that the technology features are lacking for a unit at this price. This may not be an issue for you. Maybe you prefer minimal technical features. However, if this one had more than six pre-programmed workouts or if it was compatible with iFit, it may have topped our list. You already know we love this treadmill, but if you want to read additional honest reviews from consumers you will find some at Amazon. Folks are eager to sing the praise of this product.